Nature’s Plus Source of Life Garden Family Multivitamin is a high quality whole food multivitamin supplementation. 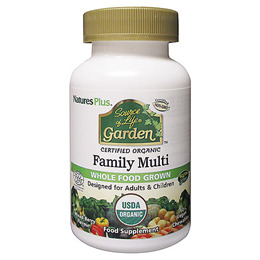 Featuring the exceptional purity of certified organic essential nutrients, Source of Life Garden Family Multivitamin is a source of whole-body natural nutrition. Each delicious, mixed-berry chewable is packed with natural and healthy goodness, so pure and safe that it is perfect for the whole family, children, parents and even grandparents! For children 4 years & older: take 1 chewable tablet daily. For adults: take 2 chewable tablets daily. Below are reviews of Source of Life Garden Family Multi - 60 Chewable Tablets by bodykind customers. If you have tried this product we'd love to hear what you think so please leave a review. Nature’s Plus Source of Life Garden Family Multivitamin is a high quality whole food multivitamin supplementation.